Like many others I’m becoming increasingly interested in the many ways we can now start to surface and visualise connections on social networks. I’ve written about some aspects social connections and measurement of networks before. My primary interest in this area just now is more at the CETIS ISC (innovation support centre) level, and to explore ways which we can utilise technology better to surface our networks, connections and influence. To this end I’m an avid reader of Tony Hirst’s blog, and really appreciated being able to attend the recent Metrics and Social Web Services workshop organised by Brian Kelly and colleagues at UKOLN to explore this topic more. In terms of CETIS, being able to illustrate aspects of our betweenness centrality is increasingly important. Like others involved in innovation and community support, it is often difficult to qualify and quantify impact and reach, and we often have to rely on anecdotal evidence. On a personal level, I do feel my own “reach” an connectedness has been greatly enhanced via social networks. And through various social analysis tools such as Klout, Peer Index and SocialBro I am now gaining a greater understand of my network interactions. At the CETIS level however we have some other factors at work. As I’ve said before, our social media strategy has raised more through default that design with twitter being our main “corporate” use. We don’t have a CETIS presence on the other usual suspects Facebook, Linkedin , Google+. We’re not in the business of developing any kind of formal social media marketing strategy. Rather we want to enhance our existing network, let our community know about our events, blog posts and publications. At the moment twitter seems to be the most effective tool to do that. Our @jisccetis twitter account has a very “lite” touch. It primarily pushes out notifications of blog posts and events, we don’t follow anyone back. Again this is more by accident by design, but this has resulted in a very “clean” twitter stream. On a more serious note, our main connections are built and sustained through our staff and their personal interactions (both online and offline). 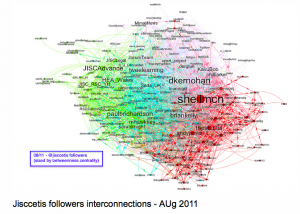 However, even with this limited use of twitter (and I should point out here that not all CETIS staff use twitter) Tony has been able to produce some visualisations which start to show the connections between followers of the @jisccetis account and their connections. The network visualisation below shows a view of those connections sized by betweenness centrality. So using this notion of betweenness centrality we can start to see, understand and identify some key connections, people and networks. Going back to the twitter conversation, Wilbert pointed out ” . . . innovation tends to be spread by people who are peripheral in communities”. I think this is a key point for an Innovation Support Centre. We don’t need to be heavily involved in communities to have an impact, but we need to be able to make the right connections. One example of this type of network activity is illustrated through our involvement in standards bodies. We’re not at always at the heart of developments but we know how and where to make the most appropriate connections at the most appropriate times. It is also increasingly important that we are able to illustrate and explain these types of connections to our funders, as well as allowing us to gain greater understanding of where we make connections, and any gaps or potential for new connections. As the conversation developed we also spoke about the opportunities to start show the connections between JISC funded projects. Where/what are the betweenness centralities across the e-Learning programme for example? What projects, technologies and methodologies are cross cutting? How can the data we hold in our PROD project database help with this? Do we need to do some semantic analysis of project descriptions? But I think that’s for another post. Over the holidays I’ve tried to take a proper break from twitter. It’s becoming such an integral part of my work life, I wanted a break. However, twitter is one of those things that does cross work/life boundaries so it is hard to keep completely away and tonight (again) twitter and the BBC illustrated the power of the social web and data visualisation. In case you weren’t aware tonight was the 60th anniversary of the equally loved and maligned radio soap “The Archers“. Tension has been building in the press over the past few weeks. Being Radio 4 it’s been in all the broadsheets! Ultimately this extended half hour episode was a bit of a let down (no thud, not that much screaming). But the twitter stream using the #sattc (shake Ambridge to the core) hash tag more than made up for script deficits. And the live website, mashing up tweets and plot lines with some great visualisations really showed how real-time social data from an engaged and (mostly) articulate community can be used. I’m hoping in 2011 we’ll be able to see some similar experiments within the educational community. What’s our equivalent sattc hash tag? What messages can we effectively visualise – innovation? impact? itcc (in the current climate)? And how can we ensure that the people making decisions about funding for HE can see the the collective thoughts of our equally engaged and articulate community? Last Friday I attended one the current series of Talis platform days in Manchester. The days are designed to give an introduction to linked data, how to work with open data sets and show examples of linked data in action from various sources including Talis. In the morning the Talis team gave us overview of linked data principles, the Talis platform itself and some real life examples of sites they have been involved in. A couple of things in particular caught my attention including FanHubz . 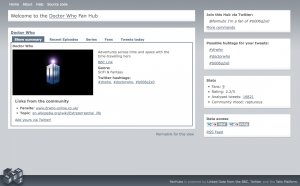 This has been developed as part of the BBC backstage initiative, and uses semantic technologies to surface and build communities around programmes such as Dr Who. It did strike me that we could maybe start to build something similar for JISC programmes we support by using the programme hash tag, project links, and links from our PROD database (now Wilbert is beginning to semantify it!). This idea also reminded me of the Dev8 happiness rating. Leigh Dodds gave a comprehensive overview of the Talis platform which you can free account for and play around with. The design principles are solid and it is based on open standards with lots of restful service goodness going on. You can find out more at their website. There are two main areas in the data store, one for unstructured data which is akin to an amazon data store, and one structured triple store area – the metabox. One neat feature of this side of things was the augmented search facility, or as Leigh called it “fishing for data”. You can pipe an existing RSS1.0 feed through a data store and the platform will automagically enrich it with available linked data and pass out another augmented feed. This could be quite handy for finding new resources, and OERs ran through my mind as it was being explained. The afternoon was given over to more examples of linked data in action, including some Ordinance Survey open maps and genealogy mash-ups leading to bizarre references to Kajagoogoo (and no, I can’t quite believe I’m writing about them either, but hey if they’re in DBpedia, they’re part of the linked data world). We then had an introductory SPARQL tutorial. Which, mid afternoon on a Friday was maybe a bit beyond me – but I certainly have a much clearer idea of what SPARQL is now and how it differs from other query languages. If you are interested in getting an overview of linked data, and an overview of SPARQL, then do try and get along to one of these events, but be quick as I think there is only one left in this current series. Presentations from the day are available online. For those of you interested in finding out more about approaches to working with linked data sets, SPARQL and “all that stuff”, Talis are running a series of platform open days. The first of these will be held on 14 May in Manchester, and the Talis team are keen to get some input from the educational sector. The day will give an overview of Linked Data including what it means to make Data into “Linked Data”, an overview of RDF, and a tutorial of SPARQL. There will also be a “Linked Data in Action” talk, giving many examples and live demonstrations of apps, mashups and visualisations built on Linked Data. The idea is to give anyone who is curious about the Semantic Web and Linked Data a firm basis on which to build. Also, if you are already working/just starting to work in this area and have any specific problems then the Talis team will be on hand to help solve your problem. So, if you are interested in having learning more about Linked Data, SPARQL and working with datasets from the BBC, UK Government, and maybe even sharing your own data sets, then sign up here. The event is free to attend but there are only 30 places. The Manchester event also coincides with the FutureEverything festival in Manchester that week. This is my first attempt at live-blogging for the Semantic Technologies: which way now? meeting, 10 December 2009. Follow the link below to see the blog which is agumented with tweets relating to the event. Semantic Technologies: Which way now? The first meeting of the semantic technologies in teaching and learning working group took place at the University of Strathclyde on Friday 3 October. The SemTec project outlined their project and there was a general discussion re the proposed methodology, scope and community engagement. A twine group has been established for the working group ( if you want an invitation, let me know). The next WG meeting will be in December sometime dates and location to be confirmed, followed by a public meeting early 2009.